Back-lighting worked very well in this image. It gives the green grass a glowing appearance and brightens the whole subject. These plants were growing along the edge of a pond, and I have found that I get my best back-lit images from these areas. I sometimes wonder if the light reflecting off the surface of the water helps to make the plants glow. It is hard for the eye to even see it - we are usually squinting against the brightness of the sun. But leave it to the camera to catch it - all part of the beauty of photography! All of the spring rains made a very lush and green swamp in early summer. The wildlife abounds here - many birds chattering, deer tracks in the soft ground, and gnawed down trees that only a beaver can create. The tree on the right side of the photo has a bird house on it - put there by the people who maintain the trail. The Audubon Society in our area keeps this trail and several others around the state in great condition. We have hiked a couple of their trails, and they are usually centered around a swamp, or sometimes a large pond. If you get a chance - check out the Audubon trails in your area - they are usually free to hike, and they usually have a simple map so you don't get lost. It's a great way to spend an afternoon - just don't forget a bottle of water, and the BUG SPRAY! All these little beauties are gone now - thank goodness we have our cameras to capture them in their full glory. This photo was taken later in the afternoon, and the sun was just off to my right. I was trying to get some back lighting for them - they seem to glow when you can hit it just right. The sun was just a bit too low in the sky to accomplish the back lighting, but the leaves are still colorful nonetheless. I find the polarizer doesn't have a big effect when the camera is in the direction of the sun. The full effect of a polarizer comes into play when the camera is at an angle - ie- 90 degrees to the sun. You can see in this image along the left side - the blue is bluer. That area is farther from the sun. The polarizer is my favorite filter, in fact I have one for each of my lens and leave it on them all the time. You do have to remember though, it is a filter, and as with all filters they are an extra "layer" on the lens that the light has to travel through. Many times this affects the exposure, so adjusting this setting is sometimes necessary. Good thing for digital cameras - you can view your image and reshoot if necessary. Also - don't be a skinflint when it comes to filters. You don't have to buy the most expensive, but go with the name brands. If you spend the money for good glass, don't cover it with a cheap filter. You will be disappointed with the results. Quality always pays off in the end. The Thanksgiving holiday is quickly approaching and the preparations have already begun. We stopped by the supermarket this afternoon to purchase the turkey as it needs several days to thaw in the refrigerator. Another trip scheduled for Tuesday should take care of all the food purchasing we need to do. We will reserve Wednesday for preparing most of this food and after the giant hustle of Thursday morning, a most grand meal will be shared with the family. It is pretty much the same each year - better not change too much - everyone counts on the traditional meal with all the trimmings. And where everyone sits, and how the table is set are two more traditions that had better not change either. For Thanksgiving, we usually use the turkey as the centerpiece. I have a set of crystal candle holders that I put on either side of it, and the long tapers stay lit until they get close to the decorative autumn flowers that are at their base. When the kids were young they use to love to use the snuffer to put them out when it was time. At Christmas, the centerpiece is always a beautiful Christmas plant that my son purchases for me. The candlesticks are once again used on either side of it - this time with decorative pinecones - the ones in the above photo. So, for one holiday, the food is the centerpiece, and for the other, a plant or flowers. What do you use as holiday centerpieces, food or flowers? What special table settings are part of your holiday traditions? This past week I have received a couple of awards from two blogging friends. Both of them were given in friendship - with no strings attached. No requirements for posting it, no rules for passing it on, and no pressure to even mention it. Given just because they appreciate their readers and wanted to tell them so. 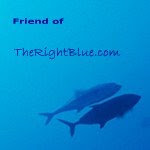 I have been visiting The Right Blue for well over a year now, and have enjoyed the adventures and Bobbie and Jerry in their underwater dives and beautiful photography. 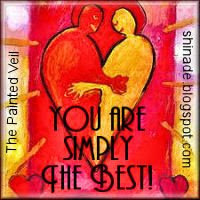 The Painted Veil is a new blog that I have recently discovered, and Jackie AKA Shinade has a wonderful heart and an infectious love of life that she conveys in all her posts. I am most honored to have these bloggers as my friends, and I thank them so very much for these beautiful awards! Harvesting energy from the sun is a great way to cut down on electric bills. I am seeing more of these solar panels go up in our rural area. Just down the road from us, right in the middle of a beautiful field, our neighbor installed four large panels. The field has perfect, clear southern exposure and the panels are placed high enough off the ground to avoid the snow build up that will be coming soon. I would think they are still going to have to clear them off though - I will keep an eye on how it all works. With all the trees around us, we do not have the correct location to get the most out of installing solar panels. We have used the small walkway lights during the summer when the sun is high enough in the sky to get to them, but I think that is the best we can do for using solar panels, unfortunately. So we have looked for other ways of saving on our energy bills. Turning off lights and lowering the thermostat are two obvious ones. But taking those a bit further, we installed the low energy, high light output bulbs in all the lights - they even make these types of bulbs for chandeliers. And surprisingly, they actually look good in ours above the dining table. Installing a programmable thermostat has helped us the most. We usually remember to turn it down when we leave the house, but nighttime is the worse - who wants to get up to a cold room in the morning. Setting it to automatically lower itself after we are already in bed and higher itself before we get up really makes a difference. I really love the idea of solar or alternative energy and until we can install some form of it, we will continue to reduce our energy consumption in any way we can. These fishermen were back early after having a busy morning. Their fishing boats are moored in the harbor, and the only way they can get to them is by taking their rowboats and rowing out to them. The rowboat is then moored in the harbor as they head out in the work boat. Very early in the morning, this dock will be empty, but as late afternoon comes around, the rowboats are so crowded against this dock, the water is not visible. They are sometimes 2-3 rows deep. Some of these boats belong to pleasure craft owners also, as there are sailboats moored alongside the work boats in the harbor. As a rule, you can usually tell which ones belong to who. Can you tell who and why? The tide was finally out so we could go down to the water's edge and explore what was left behind in the wet sand. It was quite a climb down - those rocks that are all brown - they are covered with a fine layer of slippery algae - one wrong step, and you are right down in it. It is a much more pleasant view when the tide is in - all that pretty blue water and then the nice white rocks and grass above it. It might be a more pleasant view, but I like how it looks like layers - so nicely proportioned by mother nature. An older lady was enjoying a late afternoon break beside the ocean. A book, a table, peace, and the ocean on a sunny afternoon - just doesn't get any better! No Running Around for Me! This will not be me when the day after Thanksgiving arrives. Black Friday is known for all the good deals that can be found at 5:00 AM - after one has stood in a long line for hours before. And after one runs around like a mad person trying to be first in line to actually stand a chance to get one of the great deals. And after one has spent the previous day scouring all the sale fliers, marking the pages, writing the lists, and adding up the costs of all these great deals. The route gets mapped out, and if you're lucky, a partner will take half the list to ensure the success of this madness. No - none of this for me this year! I will be comfy and warm, sitting here at my computer, making my purchases with the click of my mouse. As the sale fliers become available, the black-friday.net website posts them for each retailer. They also include all the online deals the retailers will be offering on that day too. I have been looking for one of those digital frames for my aunt, and so far I have found the best deal at CVS, of all places. Perhaps when the bigger electronic stores have their fliers ready, they may have a better deal. The best deal of the day will get our business! It's not easy to see in the photo, but if you look closely, you can see the quiver that is attached to this bow. The bow is a camouflage color, and it is really blending well with its surroundings - not what I was hoping for when I took the photo. This style of quiver holds the arrows upside down with the feathers or fletchings hanging down. I had never seen one attached to the bow itself until I saw the setup my husband uses. Most of us think of the quiver that Robin Hood used, with the feather ends of the arrows sticking up behind his back so he could just grab one from over his shoulder and fire away. One of the benefits to this style is the whole unit is together, so you just need to carry one thing while walking through the woods. It does increase the weight of the bow, and throws the balance off slightly, but it is not in the way for aiming or using the bow, and the hunter gets used to them being attached. Once he finds a back style that he likes, my husband will retire this quiver and use the kind that Robin Hood did, as that is what he prefers. If you click on the photo, it will bring you to my website where you can view a larger size to see the details of the bow and quiver. For the last couple of weeks, I have been posting images that were photographed at an abandoned miniature golf course. It had been left unused for a year as the owner had passed away and there was no interest in keeping it running. We stopped in before everything was completely dismantled, and this image shows the condition of it as nature began to reclaim it. The plot of land is still for sale, but for developers only. Our family enjoyed many outings here over the years, but as always - change must come. We have been caring for this feral cat for many years now, and I fear this winter is going to be hard on him as he is starting to show his age. He has no interest in coming inside the house, but if we are outside, he will be close by, waiting patiently for a pat, or most importantly, a meal. We could hold the front door open all day long, and he will poke his head in, but will not enter, even after all these years. I thought I might find some older cat care info online for feral cats or outdoor cats, but I am not having much luck. We will continue to care for him as long as he allows it and will deal with anything that might come along with it when it happens - hopefully not for a long while. I did run across a website that is having a FREE Pet Photo Contest! that caught my attention. A couple times over the past few years he has been obliging enough for me to catch a few good images of him. Is your pet cute enough to win you $300? Enter the Anamigo Pet Photo contest and find out. Entries that get the most votes will win daily and weekly cash prizes. Get your camera out and email your friends. Your furry friend could bring you in cash! We are lucky enough to live in a rural area where this game of paintball can be played pretty much in our backyard - or I should say - the woods surrounding it. My son set up a "lean-to" in the woods that he could use as a shelter when playing this messy game. You can see all the green colored paintballs in the hopper on the top of the gun. A cylinder with CO2 is loaded on the bottom of the gun, and that is what launches the paint balls through the gun and into the air. When the ball hits you - it makes a big splatter of green. He has special clothes that he wears so he doesn't soil his regular ones. The paint is water soluble, so it hasn't stained anything. It is also bio-degradable so it doesn't harm the plants, animals, or the environment. Surprisingly, as long as you are covered with clothes, the balls don't really hurt. On just the skin though, they don't feel too good. The face is well protected, and since they have played responsibly, there have been no injuries. In last week's Green Thumb Sunday post I mentioned that my boys had made a discovery while I was photographing some berries. As they joined me, they were all shook up and my husband tells me - you almost lost us both in one pop. Seeing their reaction had me fearing something big - but I was not prepared for what they had almost walked right into. If you look closely at this rhododendron bush, you will see a huge bee hive built within its branches. The bush was bigger than me if this gives you any indication of the size of this thing - and with all the long grass around, it was very easy to not see it as they were walking along. Check out the size of the entrance hole - many bees were coming and going at the same time with plenty of clearance. I was really bummed that I only had my 35-85mm lens with me. I didn't dare to get any closer than what I did. This hive was an absolute beauty - all the work those bees did - I really wanted to get closer to get all the details. It was my intention to get back to where it was during the summer with my larger lens, but we never had that opportunity. It was in a run-down and abandoned mini golf course which was dismantled shortly after, and I assume the nest was gone too. I hope the ones that handled its removal were all safe.